Before I watched this, I had just finished “Teso Dos Bichos” (3×18). I’ve been binge-watching The X-Files, but I’ll get into that later. Anyway. Suffice it to say, it doesn’t get any cornier during the original run than “Teso Dos Bichos”, so if this episode couldn’t prove itself an improvement over that… Well. One thing that I’ve noticed this rewatch is how, especially in the early seasons, The X-Files made its bones by treading a fine line between “now you see it” and “now you don’t.” Every case left room for plausible deniability, be it from the mouth of Scully or the U.S. government. Every resolution left everything unresolved. Every unmistakable evil could be dismissed as a relatively benign phenomenon. 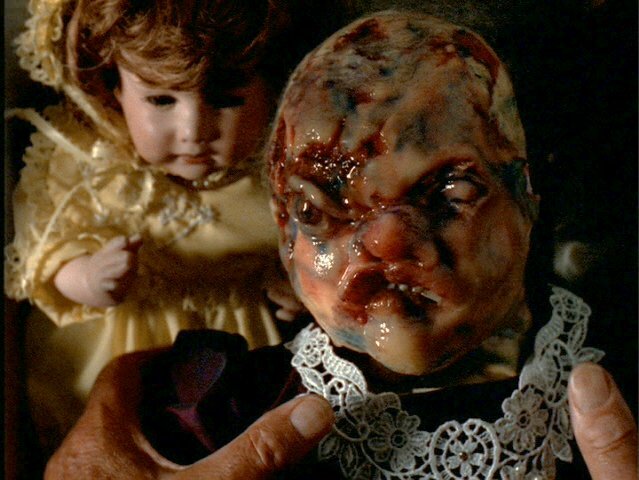 For instance, the possessed doll in “Chinga” (5×10) could easily be mistaken for a charming antique. And then… came Mr. Chuckleteeth. Obvious much? First of all, who would give a child such a nightmarish doll in the first place? I mean, tell me Mr. Chuckleteeth isn’t the Devil. He makes Chucky look huggable. But, hey, no one seems to be alarmed by the faces of those Bibbletiggles either. I’m getting my grump on not so that I can make this a rant, but so that I can get it out of the way. You know what? I’m not mad at “Familiar”. As far as the revival goes, it’s a definite hit. Of course, the revival doesn’t go very far… but let me stop. At least this week I was actually mildly curious as to who was behind it all, which is a vast improvement over every other viewing I’ve had this season. That said, I suspected it was Anna from the beginning and between being right and her only mildly nefarious motives, the ending was somewhat of a letdown. But again, going back to my rewatch, this episode feels mostly in line with the creepy, mysterious, small-town vibe that characterized Seasons 2 and 3 in particular. Even if I hadn’t been bingeing on the good stuff recently, I still would have been forcefully reminded of “Die Hand Die Verletz” (2×14). Here’s another town where the history of the New England witch trials run deep and practitioners of this sacrilegious heritage unleash an evil they can’t control. “Did you really expect to conjure up the Devil and expect him to behave?” And here’s another town, like in “Syzygy” (3×13) that (almost) opens with the funeral of a local boy, killed by “black magic”. I dunno, though. Despite all the creepy smog, blue lighting, and the distinct turn in the right direction that the dialogue takes here, I can’t help but feel that there’s something still distinctly wanting. The form has returned, for which I am grateful. But I’m missing the substance. I’m still missing the heart and soul of the show somewhere. Don’t get me wrong, I liked it. But Mr. Chuckleteeth isn’t the only thing that’s obvious. The X-Files was never great shakes at social commentary. “Teliko” (4×4) anyone? I resent Mulder’s implication of “small town justice”. In other words, we’re more likely to hear of injustice in a small town where people are stupid and less sophisticated than… who? The overpaid government workers disguised as bureaucrats in Washington, D.C.? Looks who’s playing a police officer! It’s the dude who played a police officer in every episode of The X-Files ever. Hello, Roger Cross. 24 crossover like whaaaat. And it’s Jason Gray-Stanford from Monk. Nice beard. So now Mulder has a son again, huh? Thanks for that. And thanks for teaching me how not to care. That “cauldron” joke Scully made in front of the playground, did it feel a little insensitive and out of character to anyone else? “He’s potentially John Wayne Gacy with a monkey.” Again, this sounds like what would have been a Mulder line. A magic circle of salt. Say it with me: “Fresh Bones” (2×15). If the suspect was on record as a sexual predator, even if he was only guilty of youthful indiscretion with someone a little younger than he was, wouldn’t he have been forbidden to work with children? I feel like a career as a children’s entertainer would’ve been about the last thing he’d have done. Scully: Thanks for backing me up out there. Mulder: Yeah, you’re my homie. Fight Club 7×20: It’s better just to avoid these encounters altogether and at all costs. I got grills. They’re multiplyin’. The first rule of “Fight Club” is: You do not talk about “Fight Club”. That is, unless you’re morally obligated to write a review. As I said to another Phile friend on Twitter today, I’m not sure whether I should apologize to Chris Carter for hating it so much or demand an apology for having to watch it. Shameless snarkiness aside, I know he must have been trying to create yet another golden moment for his baby, his show, his beautiful show that I adore. But “the best laid plans” and all that. I’m sorry, Chris. I’m really, very sorry. You still love me? Oh, you don’t know me? Oh, okay. Nevermind. For all its presupposed good intentions, “Fight Club” comes across as desperately chaotic instead of energetically quirky. We have two women, and later two men, who can’t be in the same vicinity as each other without fixtures rattling and the world nearly coming to an end. You know what was a better take on this theme? “Syzygy” (3×13), also penned, though not directed, by Chris Carter. But where “Syzygy” takes the idea of two people with a close affinity being destined to clash and slowly builds the antagonism to a crescendo, “Fight Club” starts at a ten and then pushes it up to a fifteen. I feel like I’m being yelled at for almost the full forty-three minutes. That’s enough of me trying to follow the plot. The plot doesn’t even matter. Betty and Lulu are caricatures that merely exist to facilitate the anarchy. Over the course of the episode they change not, neither does their situation. Scully’s closing synopsis doesn’t so much as address their recovery. Let’s move on. You would think, you would think, that the banter between Mulder and Scully would be a payoff, especially that opening scene. Instead, I find myself weary of the “Look at us, we’re Mulder and Scully of the Unstoppable UST” schtick. Yes, I know you’re not like that other F.B.I. couple, the ones who have worked together for seven years without nary a hint of romance. Five of the past six episodes have overtly questioned the sexually ambiguous nature of Mulder and Scully’s relationship. The 1013 crew may actually be overestimating how interested we are, or our tolerance for being strung along. Haven’t we established that they’re together? I’m glad they’re together. They should be together. Now, stop winking at me like you have a bug in your eye. All that opening scene in the office tells me is that they’ve been doing this too long. And by “they” I mean Mulder and Scully but am afraid that in truth, “they” might have been 1013. There’s a desperation to exude superficial charm in this episode, like they were mimicking their own magic instead of creating all new magic. I don’t know what was happening behind the scenes, but what I’m seeing on the screen reeks of stress, boredom, and joylessness instead of fun and excitement. Is it getting dull to write for Mulder and Scully? If not, then instead of yet another episode about how familiar the beats of The X-Files are I’d like a better X-File, please. Back when this aired, I remember thinking the show needed an electric shock to the heart fast or someone needed to put it out of its misery before my memories were tainted. Somebody has to do something because right now I’m thinking nostalgic thoughts about “Teso Dos Bichos” (3×18) over here. In defense of my love for you, Chris, “The Post-Modern Prometheus” (5×6) and “Triangle” (6×3) are two of my all-time favorite moments of television. So there. Why would you give your future employer all your old addresses? Old jobs, yes. Old addresses, no. I love Scully’s happy little smirk when she brings Bert Zupanic’s doppelganger into the arena. Mulder: The interesting thing about these agents is they had worked together for seven years previously without any incident. Mulder: Yeah, but they are not … romantically involved if that’s what you’re thinking. Scully: Not even I would be so farfetched. Scully: [On phone] Where have you been? Mulder: [On phone] Seeing a side of Kansas City few men have the privilege to see. El Mundo Gira 4×11: I just met a girl named Maria. Remind anyone of their fridge? This episode always brings back memories of El Chupacabra sightings that made the local news so often when I was in Junior High, sightings that no one outside the Latin American community seemed to take seriously. Funny, but despite its political grandstanding, this episode doesn’t take the legend seriously either. Last time I watched “El Mundo Gira” I decided I enjoyed it. Maybe I was feeling nostalgic about the Spanish soap operas that I hadn’t seen since I was a kid. I never understood them, but you didn’t need to understand Spanish to pick up on the melodrama. Or maybe I just finally decided that the Chia Pet style fungus in this episode is more satisfying than I had originally thought. But upon a fresh rewatch and coming off of the notable success that is “Paper Hearts” (4×8), its errors are harder to ignore. Scully: Nobody’s examined the body? Mulder: Nobody cares, Scully. The victim and many of the witnesses are illegal immigrants, migrant farm workers. Skinner: You would think that with the resources we have we’d be able to find these men. I’m not hearing a good explanation why this hasn’t happened. Scully: Well, sir, they have a way of being almost invisible. Mulder: The truth is… nobody cares. Scully: Mulder, I know you don’t want to hear this but I think the only aliens in this story are not the villains. They’re the victims. The only thing Illegal Immigrants and Little Green Men have in common is a word that ties them together by sound, no longer by connotation. Giving the Chupacabra an alien shaped head does not a parallel make, and so it’s hard to choke down what they’re trying to force feed us. On top of that, such a serious pathos undermines the pseudo-comical melodrama of a Spanish soap opera that the episode is trying to imitate, resulting in a haphazard tone a la “Syzygy” (3×13). It’s already difficult enough to take a distinct cultural legend and translate it to an “alien” audience in a way so that it carries emotional force. That experiment is rarely effective as evidenced by episodes like “Teso Dos Bichos” (3×18) and “Hell Money” (3×19). But combining serious political observations with the “Mexican soap opera” theme that many may find unfamiliar is a recipe for disconnect. I still enjoy this one though, despite itself. At the very least it gives us a few memorable lines. And one thing I’ve always loved about The X-Files is how it’s able to give the strange a scientific foothold. This is one of those episodes where neither Mulder nor Scully are correct but together they make a new scientific discovery. By the end the story morphs yet again, this time into a Rashomon style fairy tale. I can’t help feeling that if they had taken that tone all the way through, it could have been more successful. But then again, “Jose Chung’s ‘From Outer Space’” (3×20) has already been done. If this is a community of illegals, why report Maria’s death at all? Surely that would have brought the cops around long before Mulder and Scully came on the scene. Mulder: Witnesses described a bright flash about 30 degrees off the horizon, then a hot yellow rain fell from a cloudless sky. Fortean researchers call these “liquid falls.” Black and red rains are the most common, but there have also been reported cases of blue, purple and green rains. Mulder: Yeah. Great album. Deeply flawed movie, though. Mulder: They think he’s the Chupacabra. Agent Lozano: That may be. But I will tell you with a tremendous degree of certainty this guy is not Erik Estrada. Agent Lozano: This guy is better than Erik Estrada. Mulder: Scully, I’ve been thinking. I know that’s dangerous, but just bear with me. Season 3 Wrap Up: Are you sure it wasn’t a girly scream? Season 3 is a perennial fan favorite, for obvious reasons. It’s during this era that The X-Files went from a cult hit to a primetime sensation. Far from being a specific genre show, it proved it was capable of changing styles from week to week and still maintain consistency and continuity. 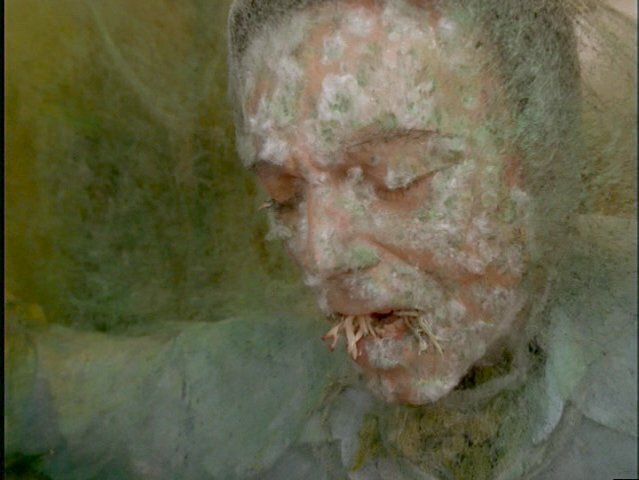 One week Mulder and Scully are on the brink of discovering alien life, and the next they’re being overrun by mutant cockroaches. Season 3 is at turns a sci-fi show, a psychological drama, a comedy and a parody. And more than anything else, it’s the Season of Darin Morgan. Sure he debuted back in Season 2 as the writer of the landmark “Humbug” (2×20) and even earlier than that he provided the story for “Blood” (2×3) and even donned a body suit to play The Flukeman in “The Host” (2×2). But three out of the four episodes he officially wrote for the series aired in Season 3. That’s not even counting his uncredited contributions to episodes like “Revelations” (3×11) and “Quagmire” (3×22), two episodes that delve deeply into the psychological background of Mulder and Scully, laying the basis for years to come for other writers who would take their characters even further. His presence on the staff actually transformed the show into something that was pliable and therefore viable. How long would The X-Files have lasted if things had stayed as serious as they did in Season 1 and most of Season 2? I daresay there’s an audience for that, myself included, but Darin Morgan introduced an era where The X-Files could lovingly poke fun at itself; this meant that the audience didn’t have to. After all, if you bring up your faults before anyone else can, it serves as a first level of defense. “Fox Mulder is off his rocker, you say? We already know. We called him on it ourselves and beat you to it.” Once that’s out of the way, everyone can sit back and enjoy without their being an elephant in the room. Self-parody is also a sign of success. “Jose Chung’s ‘From Outer Space’” (3×20) could never have happened in Seasons 1 or 2. The X-Files wasn’t set it its ways enough to exaggerate its own image. The audience could laugh at Mulder and Scully being ridiculous because they already take them seriously. And even though it’s not one of my favorites, this is a turning point in the show because from here on out, anything was game. Starting in Season 3, you can see how later episodes like “The Post-Modern Prometheus” (5×6) would evolve from this series. The writers could stretch The X-Files and it wouldn’t break. If you’ve been reading and watching along, you’ve probably already guessed what I’m going to say. I’m no sentimentalist, but the tension that was written into Mulder and Scully’s relationship for much of this season isn’t exactly my bag. It’s true that they couldn’t go on in the hyper-idealized way that they were in Season 2, where the other could almost do no wrong. And it’s also true that a certain amount of tension and drama creates interest, and I’m all for that. But there were moments this season where I wondered why they were even partners at all since they didn’t seem to work well together. Heck, at moments they were downright antagonistic. The good side of this is that when Mulder or Scully are divided, it almost invariably means that one or the other is about to benefit from some serious character development. Mulder moves beyond Samantha in “Oubliette” (3×8), even if he doesn’t move beyond the “Samantha Protocol”, and he shows off his criminal profiling genius in “Grotesque” (3×14), a skill that Scully can’t possess at the same emotional and psychological level. For her part, Scully matures in issues of faith in “Revelations”, a spiritual journey you’d think that Mulder would be able to relate to but instead is surprisingly antagonistic toward. And dividing them up for the mythology episodes was a wise decision. More information gets disseminated to the audience for one thing. And for another, Scully begins to develop her own methods of investigation. It’s a nice contrast watching them stumble upon parallel bits of information and come to wildly different conclusions. Neither one of them would get to the truth alone. But after all that division, the writers reel it back in toward the end of the season and I’m forever grateful. “Pusher” (3×17) and “Wetwired” (2×23) remind us that Mulder and Scully still do have an almost spiritual bond that’s survived the losses and divisions of Season 3. It’s a sweet but brief respite, however. Season 4 will bring Mulder and Scully both closer and further apart than ever before, a rollercoaster I’m currently bracing myself for emotionally. Season 3 is arguably when The X-Files hit its peak. Looking back, I’d say that it is… but it’s not when The X-Files hit its prime, a point of semantics that I’ll get into much later. I say this is its peak because at this point, the mythology still feels as though it’s heading somewhere, that the answers we’re waiting for are just around the corner. Anticipation is at its highest point, I believe. Will Mulder lose his mother and soon be the only Mulder left? Will Scully be able to face the details of her abduction? Will they get to the bottom of this Smallpox vaccination drama? Stay tuned. So now my question to you, dear reader, is which episode out of the Darin Morgan era is the one that speaks to you the most? Is one the best but you hate it? Is one the worst but you love it? And if you have any awards of your own to hand out, please do so below! Syzygy 3×13: Sure. Fine. Whatever. I confess, this is a tough one to analyze for me. Mainly because I’m not sure what to make of it myself. It’s like a cross between the broad clichés of “Die Hand Die Verletz” (2×14) and the humor of “War of the Coprophages” (3×12). But since it’s neither as frightening as the Morgan & Wong penned “DHDV” or as funny as the Darin Morgan outing “WOTC” it’s difficult to digest in parts. Not to say that it’s horrible. It certainly has some memorably funny moments. And one thing Chris Carter could always do better than any other writer on the show was Mulder/Scully banter. Their digs at each other are the highlight of the episode. But they’re also the lowlight. By that I mean that the comedy in “Syzygy” relies almost solely on exaggeration. Scully isn’t just a skeptic she’s purposefully obtuse. Mulder doesn’t just wonder at Scully skepticism he berates her for it. It’s as if he found a new friend on the playground in the blonde detective and together they started making fun of his old pal. It’s funny because it’s absurd that these two people who are so close end up nearly hating each other for an episode. But at times it’s hard to watch them be so disrespectful of each other, even through the laughs. Because of that I’m not sure if coming off of “WOTC” helps or hinders the plot. In defense of it helping, the tension between Mulder and Scully picks up where it left off. However, that only lends this fight more credibility, as if the damn has snapped and Mulder and Scully are letting loose on each other some long held resentments. If so, some of those resentments are pretty serious and that’s part of why “Syzygy” is hard to watch at moments. That said, I’d be lying if I said it didn’t make me laugh. Gillian Anderson and David Duchovny have incredible comedic timing that The X-Files has only had a few chances to exploit so far in the series. Part of me enjoys hating Mulder so much. Truly, Mulder deserves to be shot in this episode, not because he unwittingly (for the most part) seduces Detective White but because of the snide remarks he makes at Scully’s expense. 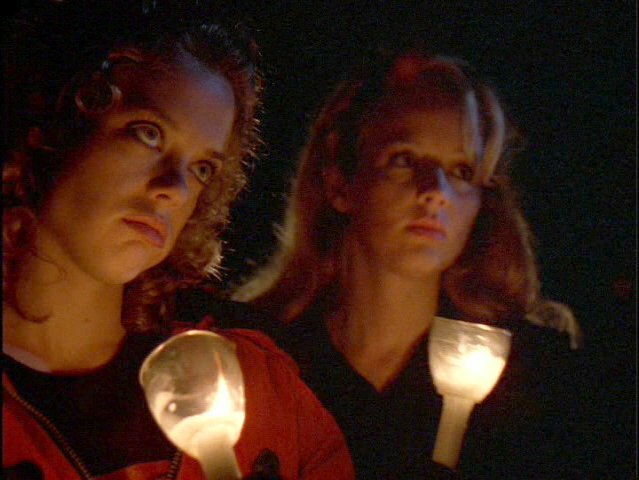 Moving away from Mulder and Scully, Margi and Terri aren’t exactly the most compelling Monsters of the Week. And, frankly, their absurd characterization is what throws the episode off at points. Whose idea was it to name these girls “Margi” and “Terri”? From their names to their clothes to the words that come out of their mouths, it’s as if someone who didn’t know any teenage girls in real life took an 80’s stereotype, electrocuted it and threw it in front of the camera. I don’t take this episode as seriously as I used to. It’s an aberration. A fluke. If it weren’t, Mulder and Scully could have potentially caused an irreparable rift in their relationship. While I enjoy the contention in the spirit of comedy, past a point the hurt feelings exposed and generated would have to be addressed and dealt with. Instead, when the clock strikes 12 and the syzygy is over, Mulder and Scully turn back into regular old mice; they’re in sync again and all is right with the world. Well, mostly. There’s still that little argument in the car on the way back. If, however, we keep “Syzygy” within the context of the series, then the tension that began at the end of “WOTC” continues through this episode even to “Grotesque” (3×14); Mulder and Scully are in a state of chronic miscommunication. This is not Season 2’s Mulder and Scully. There are times when that tension is particularly unpleasant to watch, but the end result is Season 4’s Mulder and Scully so all is forgiven. This episode attempts something similar to “WOTC” but less successfully; its tone isn’t always consistent. I think it’s clear by the end, though, that the content of this episode is meant to be enjoyed and then forgotten. Nothing Mulder or Scully say or do in this episode should be held against them in the long run. It’s an astrological anomaly. By the by, I do believe that moment in the hallway after Mulder sniffed Scully was the closest he ever came to death. P.S. Is Scully jealous? That’s easy. Yes. But in her defense, any woman whose partner ditched her for a leggy blonde and made jokes at her expense to impress said leggy blonde would have a similar reaction. Are the stars to blame for why none of the investigating officers picked up on Margi and Terri’s fake tears and inconsistent affects? They weren’t even convincing sociopaths. Wasn’t Mulder drunk not a few minutes before he drove away from the motel? I take it the look of barely restrained fury on Scully’s face sobered him up? The absurd opening funeral scene is reminiscent of “Humbug” (2×20), no? This is where I learned what a “screwdriver” was. I remember walking out into the family room to ask dear old Dad what Mulder was doing with that orange juice. Detective White is Mulder’s second potential love interest in a row. Is Season 3 his season or what? Zirinka the Astrologist almost steals the show. Scully: And you have physical evidence of these rituals being conducted? Detective White: No. No, just the murder victims. Scully: So you have nothing concrete to connect these things to Satanists? Mulder: If, uh, you detect a hint of skepticism or incredulity in Agent Scully’s voice it’s because of the overwhelming evidence gathered by the FBI debunking virtually all claims of physical abuse by satanic cults. Detective White: [to Scully] Is that true? Scully: Let me guess. They told you about a wild beast entering in on a black mass, the drinking of blood, the sacrifice of an infant… or a blonde virgin. Detective White: Yeah. That’s right. Excuse me. Mulder: You don’t suppose she’s a virgin, do you? Scully: I doubt she’s even a blonde. Mulder: Scully, it’s not what you think. Scully: I didn’t see anything anyway. Mulder: Will you let me drive? Scully: I’m driving. Why do you always have to drive anyway? Because you’re the guy? Because you’re the big, macho man? Mulder: No, I was just never sure your little feet could reach the pedals. Zirinka: I’m just waiting for authorization. Mulder: I’m a Federal Agent! Zirinka: Last I heard, the federal government couldn’t pay its bills. Okay, you’re good for up to 300 bucks. Zirinka: How can I help you?